For centuries, perhaps even millennia, people have been finding weird skulls and strange artefacts that they cannot easily explain. These range from gold coins embedded in coal to complicated tools such as the Antikythera Mechanism. The same is true for skull bones and there have been many discovered that challenge the perception of human evolution. The fairly recent archaeological discovery of miniature human bones on the Indonesian Island of Flores has lead to the establishment of a new, if contentious, species of human – Homo Floresiensis. 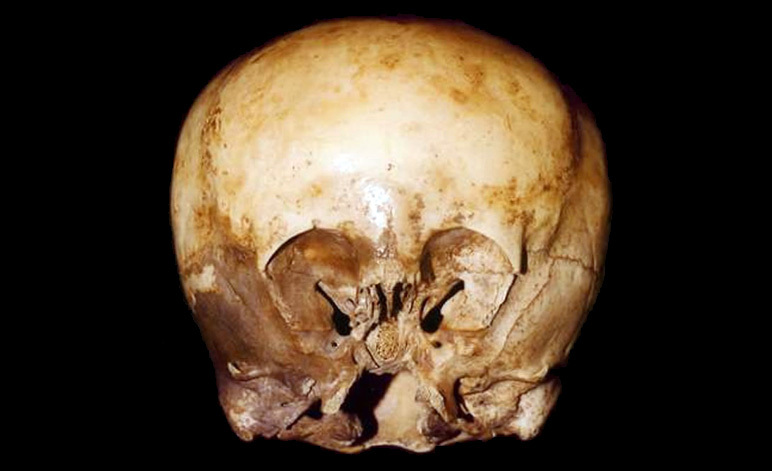 In South America scientists have revealed many strange bones and elongated skulls and in North America a small foundation has been established to study the mysterious Starchild Skull. As with any somewhat controversial topic the subject matter attracts strong views from those who support the associated findings and those that dispute them. 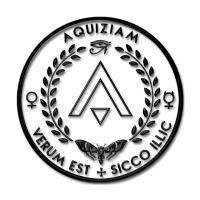 This page is an introduction to some of the weird skull artefacts and bones that have been revealed as well as some of the debate that surrounds their authenticity. There have been several reports of vampire skulls being unearthed with the most recent taking place in Venice, Italy. During the first quarter of 2009 a team of archaeologists were excavating a mass burial pit on the island of Lazzaretto Nuovo when they unearthed a female skull with a slab of rock forced into her mouth. This was a typical burial for a suspected vampire and was supposed to prevent the creature rising from the dead. The skull and associated bones were in keeping with a normal human physiology and displayed none of the physical characteristics associated with the modern perception of vampires. However, a more intriguing story is that of the Andover Skull. The information is sketchy but the basis of the story is that at sometime during the 1950’s a newly married couple, Mr F and Mrs B Morris, moved to Andover Massachusetts in the USA. They were disappointed to discover the house they had purchased had not been fully emptied and that the attic remained stacked with books, broken furniture and other such possessions. A year or so after moving in Mrs Morris finally decided to empty to attic and in the process found a heavy wooden box which had been nailed shut. That evening her husband opened the box with a claw-hammer and together they discovered a large and disturbing skull. It had unusually big eye sockets and several pieces of the bone cranium were broken. There were strange carvings on the front left of the skull but the most interesting part of the discovery were its canine teeth which were strangely elongated. 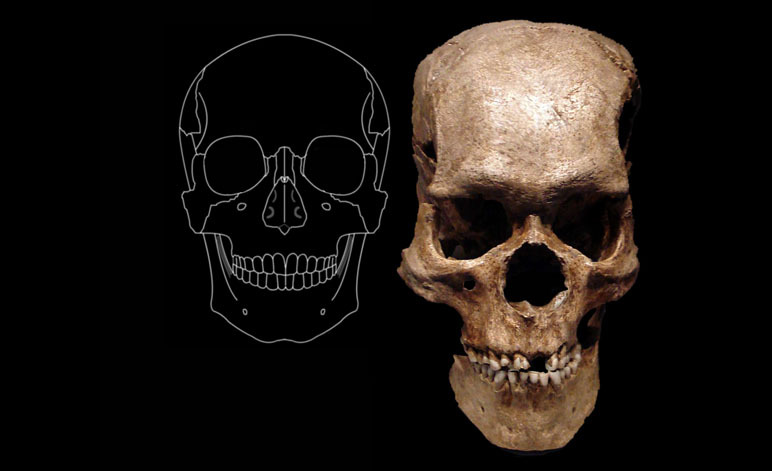 Overall the skull was larger than an average human’s and had a distinctive domed forehead. Mr Morris glued the skull fragments together and apparently kept it in his study where he would show it to curious friends and visitors. After some months Mrs Morris became distressed by its presence and insisted that it be reburied as she had convinced herself that it was demonic or at least the skull of a powerful Indian medicine man. Instead, he allegedly took the skull to a nearby Museum of Archaeology which specialised in Native American history. Of all the skulls featured here, the “Starchild” is probably the most controversial one discovered if only because of its widespread publicity. In brief, the original skull, which is estimated to be 900 years old, was discovered by an American teenage girl near the Copper Canyon district of Sierra Tarahumara in the south west of Chihuahua State, Mexico. After her death in 1990 the skull came into the possession of El Paso residents, Ray and Melanie Young in 1998. They sought the advice of Mr. Lloyd Pye who is often described as a researcher into the alternative. Shortly afterwards he established the Starchild Project to better understand the skull. There is no doubt that the skull is real. The bone is thinner than average and although it appears to belong to a four or five year old child the cranial capacity is 1600cc which is 200cc more than your average adult human. DNA testing has revealed that it has both the X and Y human chromosome which seems to indicate that it is human. However, proponents of alternate theories suggest that it could be the child of a human-alien hybrid itself. According to the Starchild Project they refute that the DNA from both parents was easily identified and suggest that the father’s DNA was something other than ordinary. Two distinct schools of thought regarding the specimen have emerged. One group see it as evidence of various theories ranging from alien-human hybrids to proof of an alternative evolution. 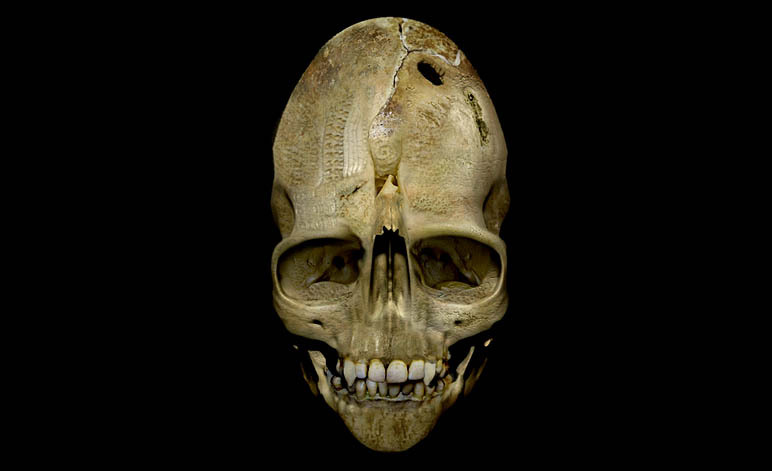 The other group believe that the skull is nothing more than a natural deformity possibly caused by brachycephaly, Crouzon syndrome or some other natural genetic mutation. Both groups’ present compelling evidence and it is definitely worth understanding both sides of the story before making up your own mind. The image to the right is from the limestone carving called the “Relief of a Royal Couple” and is believed to depict Nefertiti an Egyptian queen and is from the 18th Dynasty circa 1330BC. It is on display in the Altes museum in Berlin – Germany. Nefertiti was the wife of Akhenaton the Egyptian Pharaoh who strangely forced many social and religious changes on his subjects including the concept of Sun or Star worship. It would seem that Nefertiti was exceptionally beautiful and had many otherworldly qualities including a significantly elongated skull. 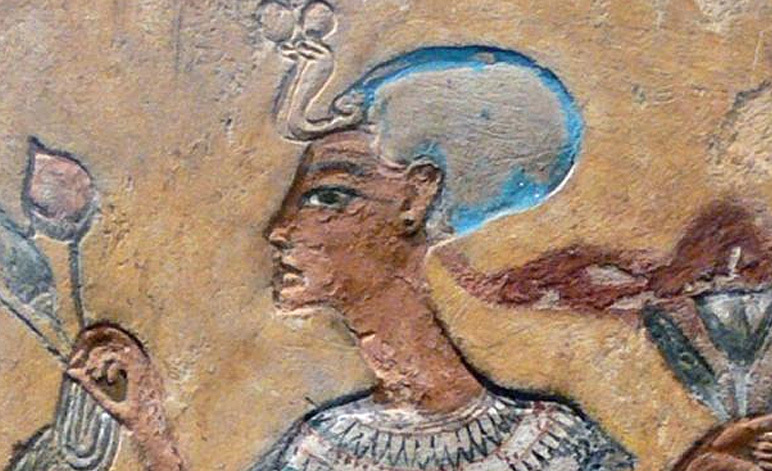 In all artworks she is either shown with an elaborate headdress or with a elongated skull. Apparently this characteristic was inherited by her daughters who are depicted in the same manner. For many years Egyptologists have dismissed this attribute as artistic license but it has become ever more obvious and accepted that the ancient artists depicted their subjects as they really appeared. If this is true then the Egyptian queen not only had a very unusual cranial structure but it was at least 50% larger than that of the average human being thus ruling out simple head-binding practices. If the depictions of Nefertiti are accurate then this woman was probably very smart and certainly not your average person. We’ll leave you to work out your own conclusions. Giving birth is an extremely painful episode for most women and is almost unique to humans. Most other creatures on this planet do not seem to experience the same degree of discomfort. This is an extremely important clue to the origin of our species that is embarrassingly overlooked by most of the scientists that study evolution. Still, as a result, life has ensured that foetal skulls are soft and pliable to allow them to pass through the bony ring of the pelvis and the vaginal canal. It is not uncommon for children to be born with cone shaped heads that quite quickly readjust to the appropriate shape. However, in many ancient cultures it became the practice to bind the infant’s head with cloths and wooden slats for a period of between six months to one year to create a shape that was socially acceptable and tribally recognisable. In a sense it was a primitive ID card that said you belonged to the “pick-your-name” tribe for now and forever. This practice resulted in a wide variety of misshapen cranial structures that still baffle modern science particularly as in some cases the volume of the brain-chamber has also been increased. This practice may have also stimulated some unforeseen side-effects. By changing the geometry of the skull it may have been possible to change the functioning of the brain. Today it would be considered extreme to carry out this practice and as a result it is almost never done. We cannot tell what psychological changes it might have created. Did it increase intelligence? Did it stimulate paranormal abilities? Did it emulate an entity that was perceived as a God? There must have been some benefit or it would not have been carried out in the first place. Archaeologists have discovered many dozens of elongated skulls from both Egypt and South America. Interestingly, these regions both had a fascination with the construction of pyramids, the stars, calendars, mummification and death. Both societies also had complex agricultural secrets and a powerful priesthood. We don’t know what this means and are reluctant to add yet another theory but it should make you stop and think – if only for a moment. In 2003 a team of researchers decided to explore and conduct excavations in the Liang Bua Cave on the Island of Flores which is part of the Indonesian chain. To their surprise they quickly discovered the almost complete skeleton of a tiny hominid (ancient human). The height of the adult female skeleton was approximately 3 ft 6 in and displayed many characteristics that indicated that a new species of human had been located. This was reinforced by the simultaneous discovery of tools and artefacts consistent with the size of skeletons. There were also indications that the “little People” had used fire and had hunted a range of now extinct animals including giant rats and miniature elephants known as Dwarf Stegodon. 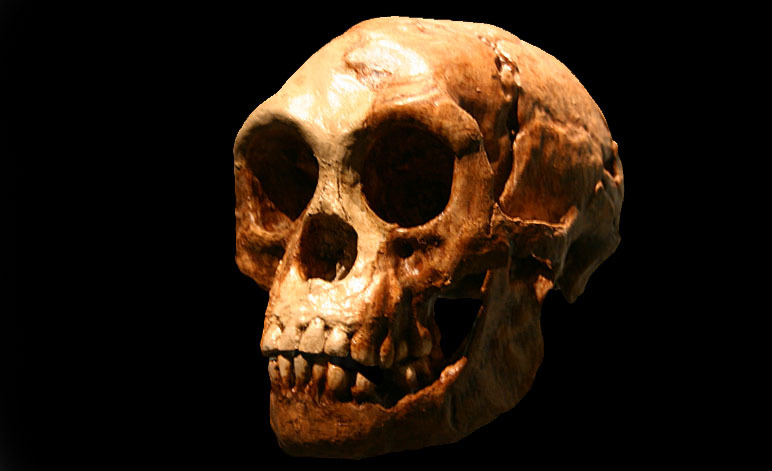 The cranium has a sloping forehead and no specific bone-based chin although it does have human-like teeth and all indications are that it walked upright. Although there is still some controversy over whether Homo Floresiensis in a new species or is just a variation of modern humans or perhaps Homo Erectus, there is no doubt that a strange population of human-like creatures once lived on the island. In fact, according to local legends there still references to tribes of “little people” that live deep in the forests. 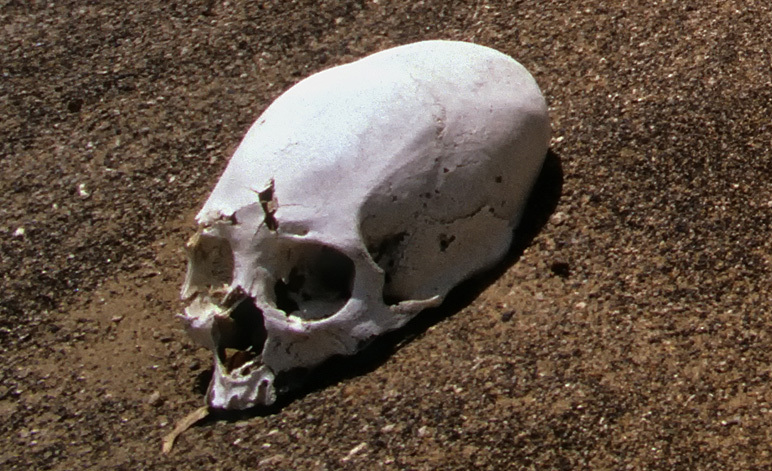 The skull is much smaller than that of a modern human but the prefrontal cortex is still the same size as modern human beings indicating a high degree of intelligence and self-awareness. Many researchers into Homo Floresiensis go to great lengths to explain that these people were not pygmies or dwarfs they were something unique. As such, they have been given the nickname – hobbits – after the famous Halfling folk from the Lord of the Rings trilogy written by J. R. R. Tolkien (1954). Whilst most of the serious scientific community agree that the crystal skulls on display in various museums and private collections are not pre-Columbian artefacts and were made between the 18th and 19th centuries, there may be some deeper aspects that remain uncertain. To start with, scientific testing is based on the body of knowledge available at the time of the test. For example, should a new (and similar) skull be discovered in a well documented excavation it would provide the scientific community with a new perspective to consider? The most common challenge to the authenticity of the skulls is the evidence that they appear to have been made with fairly modern tools which were not available to the Aztec pre-Columbians. However, this also makes the assumption that simply because they have not been found such tools they never existed. A simple study of paleontology clearly shows that all the fossils ever found probably represent less than 0.1 percent of the bio-diversity that has existed in the past. Still, it is probably likely that the skulls of which we are aware are best viewed as modern creations. 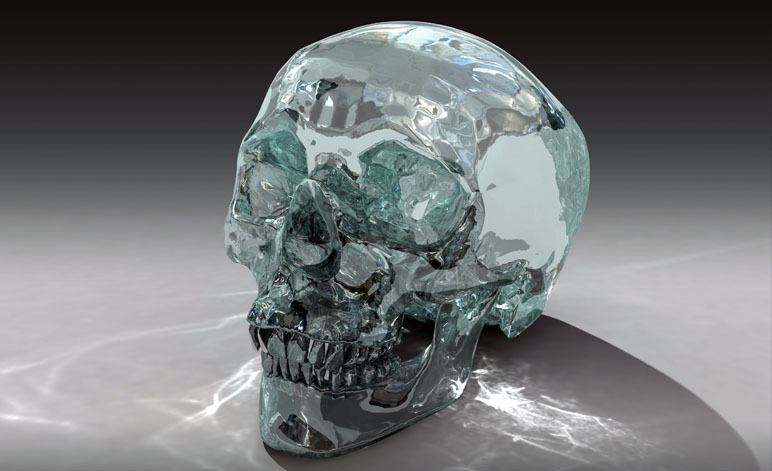 However, there has also been some speculation that these crystal skulls were all modeled on an earlier skull that was remarkably detailed and that had been taken from the body of a fallen god. It is this theme that is explored in the very popular film released in 2008 “Indiana Jones and the Kingdom of the Crystal Skull.” Given the trade in real and fake pre-Columbian artefacts that emerged in the 1870’s and 1880’s it is possible that such a skull existed or the story was a popular myth amongst traders in central and South American antiquities. Whatever the true origins of the crystal skulls they remain on display in respectable museums and continue to fascinate people. There are numerous accounts of human beings with horns. Unfortunately, many of them are poorly documented and even worse, the possession of the artefacts has been mismanaged to the extent that the records become very questionable. Still, there is definitively a powerful socio-genetic memory of human-like creatures with horns and they are usually depicted as evil or at the very least, powerful and destructive. Satan is the most obvious example but many demons, giants, biblical creatures, shamans, witch doctors, the Minotaur and (possibly) mythical creatures such as dragons all had horns. The unicorn is the exception … although it is also said to have a fascination with young virgins which is a bit odd when you think about it. 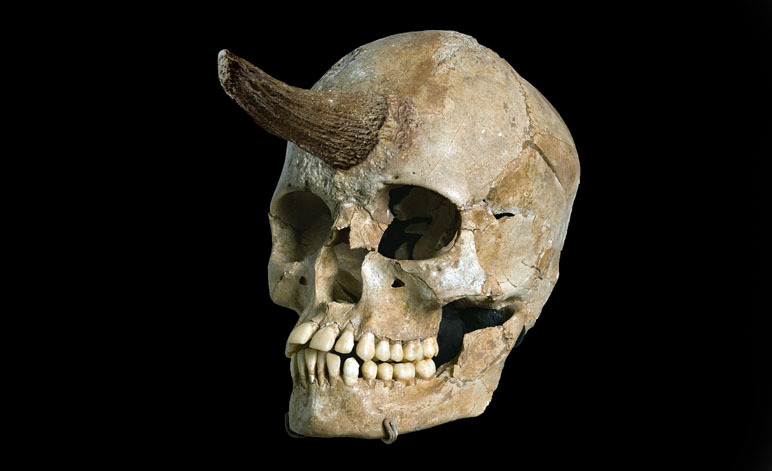 The main source of the belief in real horned skulls comes from an entry in the book, Mysteries of the Unexplained published by Readers Digest in the 1990’s. The section refers to the discovery of a number of skulls that clearly had horns projecting above their eyebrows. Basically, the skulls were supposed to have been found by reputable people in a burial mound in Sayre, Bradford County, Pennsylvania, in 1880. Unfortunately, the original story was exaggerated by the press who confused a statement about individuals that had been buried with deer horns. It was 1916 after all. The story re-emerged on the internet as early as 1996 and has been the mainstay of the horned-skull belief for well over a decade. There are also many references on the internet to a horned-skull on display in the London Museum. Well … we went there and looked for it and couldn’t find it. Maybe it’s in a secret room. The picture to the right and above is a fake. It’s quite a good fake and we fully expect to find it at the heart of some horned-skulls proof a few years from now. Still, it’s a fake created with the help of Adobe Photoshop. It’s also worth noting that “freak shows were once a popular form of entertainment and unfortunate people with rare skull deformities (such as The Elephant Man) were displayed to the general public. Unscrupulous carnival owners would have amazing artefacts manufactured and horned skulls were popular. If you sift through the internet you will find quite a few pictures and descriptions of people with horns. Unfortunately, it is very hard to know if they too are real or not. We’ve included this section on horned skulls not because there is significant proof of their existence but because so many people truly seem to believe that they have existed at some point in the past. Over the years archaeologists and explorers have discovered many unusually large skulls that have intrigued scientists from around the world. These giants may have simply been human anomalies or may represent a branch of anthropology that remains a mystery. It is worth noting that there are various medical conditions that can cause “Giantism” or more correctly, Gigantism. Pituitary Gigantism is the most common and is caused when the when an excess of growth hormone is released during puberty. However, skulls from people afflicted with this condition tend to display characteristics that can fairly easily identify this as the cause. Some of the giant skulls discovered are also simply explained as being those of the Neanderthal species of human beings (Homo Sapiens Neanderthalensis) that became extinct approximately 15,000 years ago. Still, there are other skulls that defy such simple analysis. Two cases stand out and are worth mentioning even though one may well be a hoax. The first is the Lovelock cave find. In 1911 a team of guano miners, who where excavating the cave, began to unearth various Native American bones and remains. Archaeological teams were brought in and over the next 15 years various mummies and skeletal remains were discovered. From various bones, and particularly the femurs, it was concluded that the average height of the buried skeletons was ten feet tall. Many of the bones were sent to scientists and educational institutions and over the course of time have become lost. However, some of the finds, including a giant skull, can still be viewed at the Humboldt Museum in Winnemucca in the state of Nevada. Legends of weird giants are common in almost every part of the world. They range from those of merely tall people to truly gigantic beings that can move mountains. (Shrewsbury Giant) This is clearly a shared belief-memory that deserves more investigation. At the time of writing the tallest, scientifically recorded, man was Robert Pershing Wadlow who was 9ft 11in. His skull was 36% larger than that of his father. Another recent giant was Anna Haining Bates who reached 7.5ft in height and had a cranial capacity 22% larger than her father. Records indicate that she was extremely intelligent.